What is the difference between wired and wireless IP Intercom systems? 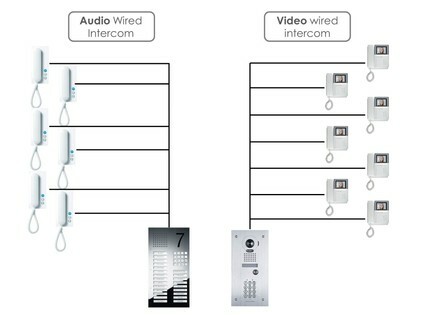 A wired intercom is an intercom with wires running between the outdoor speaker panels, master panels, and the indoor units it is connected to. Usually the cable used is a two-conductor, shielded wire, but could be a computer network type CAT-5 cable depending on the type of intercom system. The shield on the two-conductor wire helps the wire resist picking up electrical interference from other electrical devices that could produce a buzz or hum on the intercom system. CAT-5 systems are usually digital devices so they do not have this problem. The two-conductor systems are used for both commercial and residential properties. These systems generally comprise of two main components. The second component is called the "master station" and this is fitted inside the property. Depending upon the size and general layout of the property it may be more convenient or practical to have more than one master station. With these systems, when a visitor arrives at the door they press a button on the door station and this triggers a short tone at the master station(s). Someone inside the property then answers this tone and the two parties are able to communicate with one another. The person at the door can communicate without pushing a button and the person at the master station has to push a button. Using outdated technology, wired intercoms are often very costly and labour intensive to implement, maintain, and repair. A residential condominium with 200 units, will need to have 200 door panels, with 4 outdoor stations (4 side gates), and several master panels. whether it is an upgrading project or a new development, infrastructure works consisting of cabling to each unit has to be done, which is very labour intensive. In Singapore, infrastructure and cabling works for such a project can add up to hundreds of thousands of dollars. Additionally, door panels for every single home must be purchased for full functionality. Users have to be at home to answer calls from visitors using the home door panels. The limitations of wired intercoms are solved with wireless intercoms. In the example above, the solution might be as simple as 4 wireless intercom panels can facilitate visitor tenant communication for the entire 200 unit residence. ​A wireless intercom is a single standalome intercom entry system, fitted at the entrance to condominiums, apartments, buildings or next to an entrance. Wireless outdoor intercoms not only have the benefit of not requiring installation of cable, they also allow for mobility of the person or people monitoring the outdoor wireless intercom. With wireless intercoms, visitors are able to communicate with residents on their mobile phones, anywhere they might be. Minimal cabling works will be needed as each intercom panel simply requires a power supply and an internet access point. The use of communication means such as the fixed telephone network or internet access points directly to high speed cloud servers means that physical intercom handsets in apartments can be replaced with the residents’ mobile phones or smartphones. For decades now security system dealers, gate installers, and other companies have been installing intercom systems that use telephone lines for access control and voice communications. ​With the growth of the Internet and wireless phones, people are moving past the need of primitive individual unit panels wired to each unit, and the days for installing wired IP intercom systems are numbered. The Schonell interphone is a wireless intercom system. Learn more. Learn more on the differences on Digital IP and Analog intercom systems here.